I have taken a little break from posting, this is because I have gotten a job. I have been working very hard over the last 4 years networking, blogging, doing YouTube videos, and just getting my name out there and volunteering. And it has finally paid off and I am officially employed. I feel like the missing piece to my puzzle has been filled. I am someone who needs to feel like I am doing something, I want to contribute to my famillies income. This has always been very important to me, now I realize there are people out there who do not have this same desire and that is fine I am not judging at all. But for me this is what I needed. 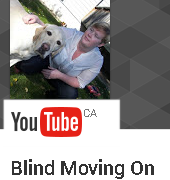 I am working with the CNIB and it is amazing to work with an organization where accessibility is the norm. I don’t have to worry if it is possible to make things accessible or if I am going to have to constantly be fighting for equality because again it is the norm. Being treated as Ashley in the workplace is amazing, I am not the blind lady who works at such and such place. My vision is never an issue, in fact in this instance it is an asset. I can say I have never had a job where my vision was a asset, so it is refreshing to be in this position today. There is also this sense of guilt that comes along with this job for me, because I know that there are so many people out there who are still where I was only a few weeks ago. Fighting for the chance to have a equal chance at employment. So even though I have finally been successful in getting employment, my fight is not over. I will continue to fight for those that are still working to get employment and are not given the opportunity simply because of their disability. Disability does not mean lack of ability, and until I can get the world to see those living with a disability as the people they are I will not stop. Thank you to everyone who has supported this fight and to those that have supported me through this journey. Finding that “Me” Time ! It is a struggle. I would like the same thing in my own life. I feel a bit lost in the process. Congratulations on the job. Congratulations. You will be a fabulous asset to the CNIB. I love reading your blog and have learned so much from you, on so many levels. Thanks. Congratulations. Not because “the blind lady” got a job, but because jobs are not easy to find find or get. Employers have choices. They chose you because you can do the job. it doesn’t matter whether people have a disability or they don’t. it’s always difficult finding employment these days regardless of what country we live in. I had a job and inicially I thought it was for the long hall but in fact it ws a 12 month contract. I enjoyed this particular job I had and it gave me something to look forward to twice a week. My father over the course of 5 years or so has asked me if I’d consider a job that allowed me to work from home and my answer has always been no. One of my employment agency case workers at the time said it would be better for my social wellbeing for me to be in the workforce which I continue to say seems my father still doesn’t get the memo lol. It’s all very well to take resumes around to businesses but not being acknowledged as far as I’m concerned is very disrespectful.